This wonderfully situated cottage combines convenience, privacy and direct access to the shore, where there is a wide beach framed by massive ledges complete with tide pools, mussel beds, and other fascinations for young and old. The cottage is a comfortably furnished vacation home with a fully equipped kitchen and large outside deck. On the ground level are the living room with dining nook, full kitchen, master bedroom, bath and laundry. The second floor contains a very large room with twin beds at one end and an additional single bed (partially screened) at the other as well as a full bath. Ours is a prime location at the tip of Clark Point, which separates Southwest Harbor from Somes Sound. The cottage enjoys a private location about 100' back from the shore with views over a hay field to the mouth of Somes Sound and the mountains of Acadia Park beyond. From our cottage it is a three minute walk in one direction to the historic Claremont Hotel and in the other, to the town dock, lobster wharf, and pick up point for the free Acadia bus. A few minutes further brings you to the ferry dock with service to the Cranberry Islands. The Southwest Harbor town center is now less than half a mile, as are boat and bike rental facilities, the Gilley Museum, and varied restaurant and shopping opportunities. The lakes and mountain trails of Acadia National Park are within a 5-30 minute drive, as are the Causeway Club and Kebo Valley golf courses (both open to the public at reasonable rates). In short, this is the place to be for a vacation during which everyone will be in contact with the wonders of nature and very happily engaged. This property has been in our family for almost 70 years and has been the source of enormous joys and memories of four generations. It gives us pleasure to be able to share it with others so that they too can appreciate what we have been given to enjoy. Perfect place and location for our needs!! The house is rustic, stocked with all we needed, has a great view. The cottage was quaint and basic but had everything we needed for our stay. The back deck has a beautiful view of the water. We saw deer right outside the house. Secluded feeling while an easy walk to the town and Beal's Lobster House. Worked well for our group of 5. 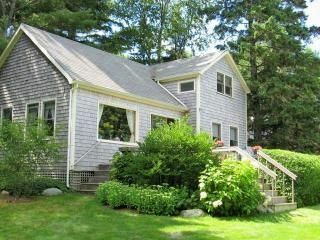 Beautiful and convenient location to Southwest Harbor village and Acadia National Park. Rustic but with all the conveniences. We have stayed at the shore cottage twice, first as a couple and just recently as part of an 11-person family reunion (the cottage was allocated to the four younger family members). It served admirably in both cases. The cottage and the main house which it adjoins are located on a spectacularly beautiful spit of land, stone and sand at the southern end of Somes Sound looking over to the mountains of Acadia National Park. The view northward up the sound is one of the truly splendid sights on an island (Mount Desert) which abounds in wonderful vistas. The town of Southwest Harbor somehow manages to cater to rent-paying visitors (it is full of interesting restaurants and an excellent bike shop) without losing its character as a year-round fishing village. If you like Maine, this is perfect heaven.